The somatosensory cortex is a strip of brain that governs bodily sensations, both proprioceptive sensations (sensations of movement or the body&apos;s position in space) and cutaneous sensations (those of pressure, vibration, touch, and the like). Previous to the new work, neural implants targeting similar brain areas predominantly produced sensations such as tingling or buzzing in the hand. The Andersen lab&apos;s implant is able to produce much more natural sensation via intracortical stimulation, akin to sensations experienced by the patient prior to his injury. The patient had become paralyzed from the shoulders down three years ago after a spinal cord injury. Two arrays of tiny electrodes were surgically inserted into his somatosensory cortex. Using the arrays, the researchers stimulated neurons in the region with very small pulses of electricity. The participant reported feeling different natural sensations -- such as squeezing, tapping, a sense of upward motion, and several others -- that would vary in type, intensity, and location depending on the frequency, amplitude, and location of stimulation from the arrays. It is the first time such natural sensations have been induced by intracortical neural stimulation. The next major step, according to Andersen, is to integrate the technology with existing neural prosthetics. In 2015, Andersen&apos;s laboratory developed brain-machine interfaces (BMIs) to connect a prosthetic robotic arm to electrodes implanted in the region of the brain that governs intentions. In this way, a paralyzed man was able to utilize the prosthetic arm to reach out, grasp a cup, and bring it to his mouth to take a drink. 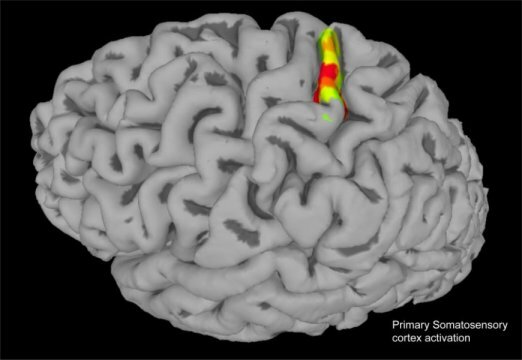 Connecting the device with the somatosensory cortex would create bidirectional BMIs that would enable a paralyzed person to feel again, while using prosthetic limbs.